Sunday September 20th marks 50 years since the passing of eminent geologist Arthur Holmes. The CRC is currently marking this anniversary with a micro exhibition celebrating his life and achievements. Although many people have never heard of Holmes, he was arguably the greatest British geologist of the twentieth century. Geologists today recognise Holmes for making two major contributions to our understanding of Earth Science; he was the first earth scientist to recognise that heat within the earth could create currents that could move the crust of the planet and consequently rearrange the continents, and he also widely applied the newly-developed method of “radiometric dating” to minerals in the first attempt to numerically estimate the age of the Earth. It was as an undergraduate, at London’s Imperial College, that Arthur first became interested in the phenomenon of radioactivity, which was a new and exciting field in science at the time. Originally studying for a degree in physics, Arthur took a course in geology in his second year which settled his future as a geologist, much to the shock of his tutors! It was during his final year as a student, in 1910, that he pioneered the use of radiometric dating, a technique that can be used to date rocks and minerals. It was this method which allowed scientists to discover the age of specimens which are many millions of years old, and eventually to attempt to discover the age of the earth itself. Initially Holmes was reluctant to comment on the age of the earth, but by 1913 he had published results indicating that some of the oldest rocks identified were 1.6 billion years old. Years of method improvement and retesting followed and in 1946 several different groups of scientists came to agreement – the Earth is in the region of 4.5 billion years old! Holmes was also able to use his understanding of radioactivity and apply it to other longstanding geological problems, including suggesting that currents caused by radioactive heat were the driving force behind the Theory of Plate Tectonics. The Theory of Continental Drift, which predated Plate Tectonics, was unfashionable among scientists because it lacked a driving force to create movement of the Earth’s crust. Holmes suggested, in 1930, that the circulation of heat within the Earth could push large areas of the crust together, forming mountains such as the Himalayas, or away from each other, producing oceans such as the Atlantic. It was not until 1960 that other scientists were able to find physical evidence for the movement of the continents when sea-floor mapping revealed submarine plateaus and trenches, where tectonic plates were being pulled apart or forced underneath each other. Thankfully Arthur Holmes was well recognised as an eminent scientist in his life time and he was given the prestigious position of Regius Chair of Geology at the University of Edinburgh. In addition to securing a professorship, Holmes received many awards and medals from international geological surveys and societies including; the Murchison Medal (1940) and Wollaston Medal (1956) awarded by the Geological Society of London; the Penrose Medal (1956) awarded by the Geological Society of America; and the highly prestigious Vetlesen Prize (1964). 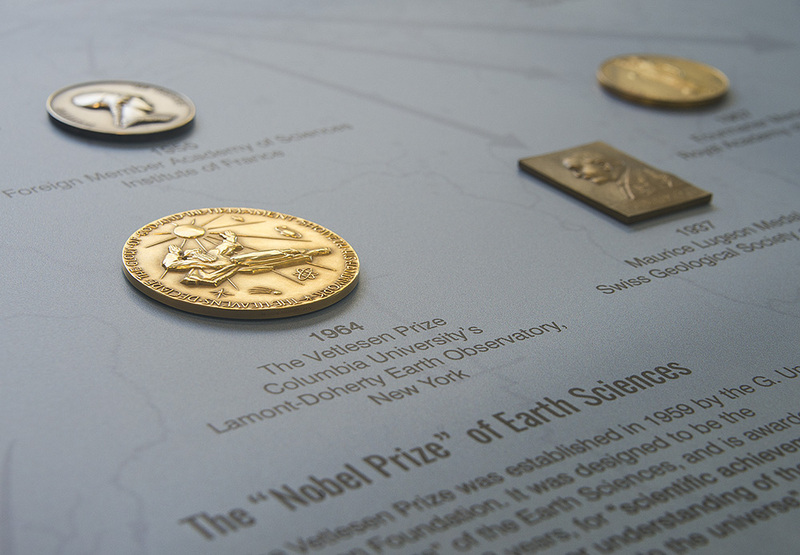 The Vetlesen Prize was established in 1959 by the G. Unger Vetlesen Foundation, and was designed to be the Nobel Prize of the Earth Sciences, awarded for “scientific achievement resulting in a clearer understanding of the Earth, its history, or its relations to the universe”. Characteristically both modest and forthright in his acceptance letter, Holmes expressed his surprise at being selected “for what must surely be the highest distinction in the world for geologists. The surprise was all the greater because I have to confess that I had not even known there was such an award”. Holmes shared the award of $25,000 with his friend the Finnish geologist, Professor Pentti Eskola. Unfortunately Arthur was suffering poor health and was unable to travel to America to receive the prize. The Royal Society London held a luncheon party in his honour where another famous geologist Maurice Ewing presented him with the medal. Ewing, who was the first recipient of the Vetlesen Prize in 1960, praised Homes as a “pioneer in the field of isotope geology, in the use of radioactive elements for determination of the age of rocks and of the Earth… His papers, books and teaching have profoundly influenced the thinking of every modern student of the Earth Sciences”. 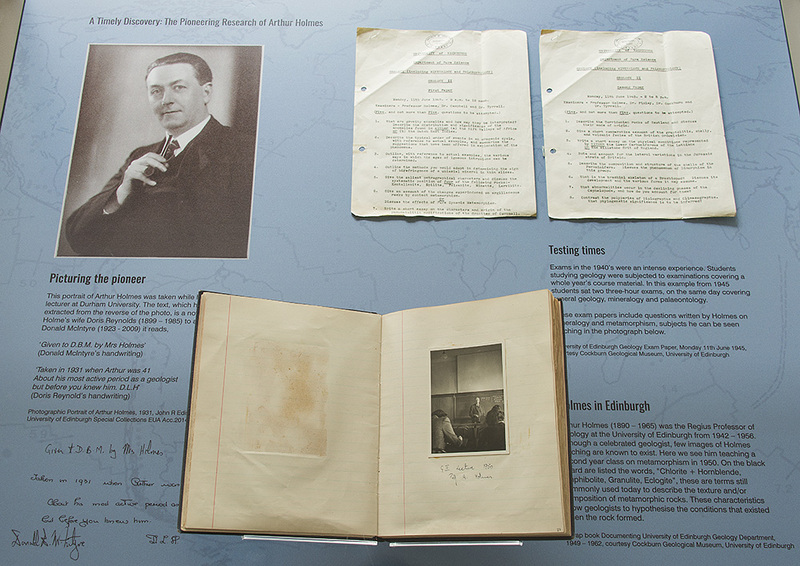 The micro exhibition devoted to Arthur Holmes is on display until the end of October at the Centre for Research Collections. Blog post by Gillian McCay, co-curator of the School of GeoSciences Cockburn Museum collection. Edited by Steven Skeldon, Centre for Research Collections. Credit for photographs to Susan Pettigrew, University of Edinburgh Digital Imaging Unit.